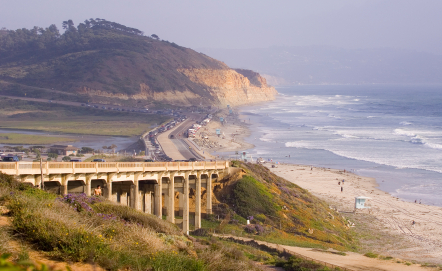 Del Mar is an upscale, resort beach-town offering hotels, shopping, and world-class restaurants. The Pacific Coast Highway (Camino Del Mar) runs right through the middle of town, and the intersection of Camino Del Mar with 15th Street is the center for shopping and dining. On the northeast corner you can explore the Del Mar Plaza shopping center with three terraced levels of haute couture and ocean view dining. Heading south on Camino Del Mar, you’ll find even more great restaurants and stores. On the bluff at the West end of 15th Street, you will find Sea Grove Park, a beautiful public park on the bluff that’s popular with families and picnickers. Just down the hill is Powerhouse Park with the Community Center. The beach in front of Powerhouse Park is an ideal place to learn to surf and instructors teach surfing lessons here. From this point northward to 29th Street, private homes front the beach with public access corridors at every cross street and lifeguard towers (active in season) every few blocks. These beaches are extremely popular because other beaches in the area are below bluffs and are difficult to access. The beach South of 15th Street (and Sea Grove and Powerhouse) all the way to Torrey Pines Beach is fronted by low cliffs, with precarious foot trails. There are patches of rock and reef offshore here that appeal to surfers, but make this portion of the beach less than ideal for swimming. Del Mar is home to the Del Mar Racetrack and Fairgrounds. The fairgrounds are a world-class, multi-use, public assembly facility with an emphasis on agriculture, education, entertainment and recreation which hosts nearly 350 events each year. During the busy summer months, the Fairgrounds host the San Diego County Fair (in June and July) and thoroughbred horse racing at the Racetrack (July through September.) These events, combined with the popularity of the beaches make the summer a lively, fast-paced, crowded time. Once school resumes in the fall, the crowds thin, things slows down and the residents settle back into their small beach-town routines. Housing in Del Mar ranges from Multi-million dollar oceanfront estates to studio apartments near the beach to track homes and everything in between. Regardless of your living situation, the great thing about Del Mar is that the best things to enjoy can be enjoyed by anyone. The beach, fairgrounds, racetrack, miles of hiking in Torrey Pines State Park, shopping, a variety of restaurants, and central location appeal to everyone.